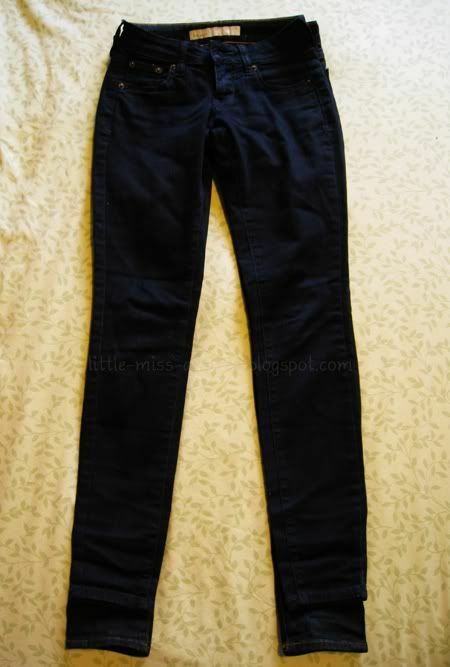 Without a doubt, one of my best purchases of 2011 was my J Brand skinny jeans off Hautelook. I have a couple pairs of J Brand's, but this one is my favourite of them all. On a whim, I visited Hautelook and the skinny jeans were on sale and with a sz 23 available. I immediately snagged them up and have been wearing them nonstop since. Why do I like them so much? The inseam length and the fit. I think they were made to be ankle jeans for the taller ladies out there, but the short inseam works very well for me as I just tuck in the bottoms seamlessly (about 2") and they are still comfortable. The jeans hug my legs in all the right places, and I love the shorter rise and snug fit in the hips! 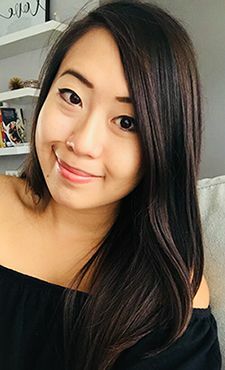 Recently, one of my favourite bloggers Wendy wore the Old Navy Rock Star Jeggings in a post - she looked fantastic in them! I was curious and looked into them right away. The ON jeggings come in a wide array of colours and with a variety of fit options (!!). They come in regular, tall and petite fit, with the regular running in three different inseams - short, regular & long. When I was ready to order, there wasn't a colour I wanted in 0P, so I ended up ordering the 0R in Ruby with a short inseam. It seemed to me that the major difference between the two was the inseam, where petite features an inseam of 29.5" and short with a 30" inseam. However, upon arrival, my pair with the short inseam had a measured inseam of 27"! Perfect. 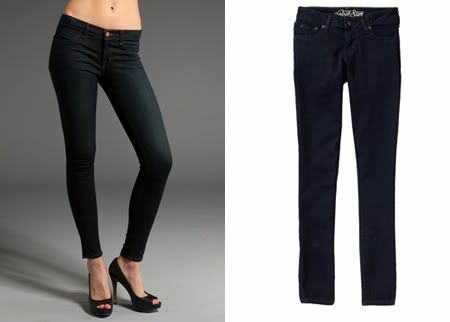 As in the comparison pics below, you will see that the J Brands and the ON Jeggings fit exactly the same. The only difference is the inseam length, by which I prefer the ON Jeggings since I don't have to fold them up at all! For reference, I have very short legs. My measured inseam is 26"
The Old Navy pair is actually a tad stretchier than the J Brands, giving me leeway when I pig out on food! (Almost always, haha) The pricepoint is fantastic, coming in at under $50 per pair with tax included. That being said, Old Navy consistently has sales and deals on their website, so it's likely that the jeggings can be purchased at a much lower price. Compare that to the $212 price tag of the J Brands. So what are you waiting for? Pick up a pair if your size is available! I highly recommend them. 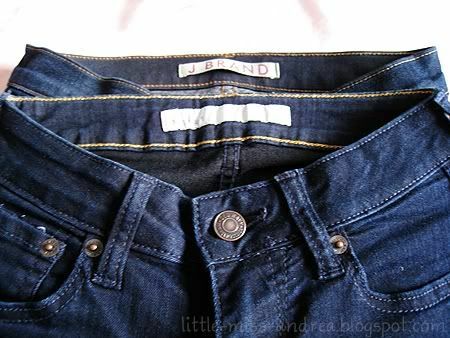 J Brand is my favourite jean brand :) I have 5? pairs right now because of their super long inseams (mine is 34") and that they shape my bum perfectly! I've looked into getting those ON rockstar jeggings too, except in the red colour! Waiting for them to go on sale. I'm sad that they don't have the TALL version in store cuz I'd like to try them on before buying them! 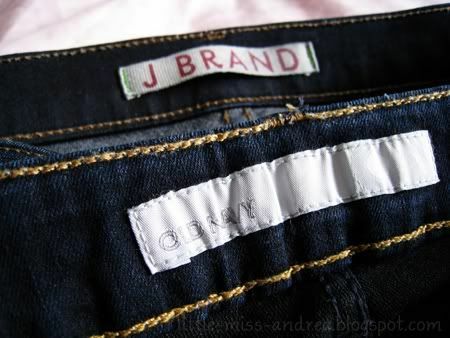 I love J Brands too though these Old Navy ones seem like a good alternative. I've been seeing them on quite a few bloggers these days and they look nice and stretchy. Thanks for the review! I haven't tried any J Brand jeans though I really want their turquoise coloured ones! I'm glad to hear that Old Navy's Rock Star jeans has a better fit/stretchier than the premium denim though :) Thanks for the review! Thanks for giving such a detailed review on the Old Navy jeans. I love J. Brand and 7 for All Mankind(but not the price, of course). Nice to know that these ON jeans fit very close to J. Brand and cost a fraction of it. Following you now, such a great blog! Thanks for this review. I'm always hesitant to try a new brand for jeans, and after reading this I think I will give Old Navy a shot! Thanks for the review. Never had JBrand jeans before and I am really curious about it too. OHHH!! nice to know the old navys are similar to the j brands!!! i will have to check these out online :)!! thanks for the tip hon! I have both the J. Brand & the Old Navy Rockstar and honestly I like the Old Navy better! I just wore them for my last blog post...the Old Navy's fit me better but the J.Brand are much much softer.